Fact or Fiction you Decide! Monsanto is currently marketing an Aluminum resistance gene crop. Why? Is it coincidence that Monsanto will “come to the rescue” with Aluminum resistance gene crops, because normal plants die off in the presence of excess Aluminum? Aluminum changes the Soil on the pH Scale towards the neutral and most plants need an acidic pH to thrive. Or is this an opportunistic capitalism and planned corporate food monopoly, courtesy of Monsanto and the Hegelian Dialectic based on insider information that a proposed “geo-engineering” scheme is already in place that is filling our atmosphere with Chemtrails containing Aluminum and Barium? If Monsanto is coming to our rescue, run for the hills. Monsanto’s track record has proven that they only have their interests in mind and don’t give a damn about you or your families health. 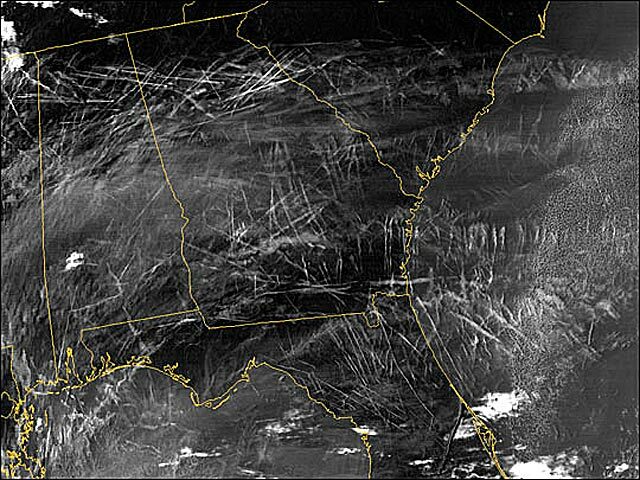 The word “Chemtrails” is a knock off of the word “contrails.” Contrails are trails of condensation that can be seen in the sky when a jet airplane is traveling at above 30,000 feet altitude. They usually dissipate and fade away as the moisture once again returns to form invisible ice crystals. 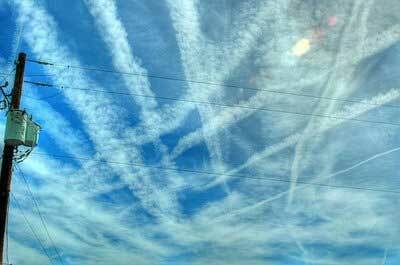 “Chemtails” are not Contrails. “Chemtrails” are something different. They are often formed behind jet aircraft at a much lower altitude and seem to persist in the sky. They often have a different color from contrails and frequently exhibit a rainbow spectrum if lit just right from the sun. 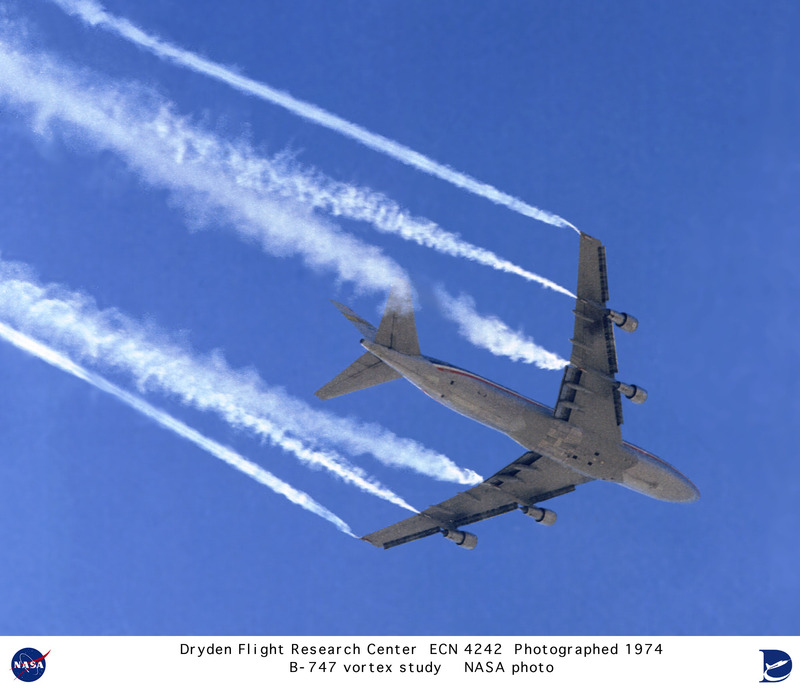 Such operations have often been dismissed as conspiracy theories, or in many cases a misinterpretation of condensation trails (contrails). However, the facts speak for themselves. 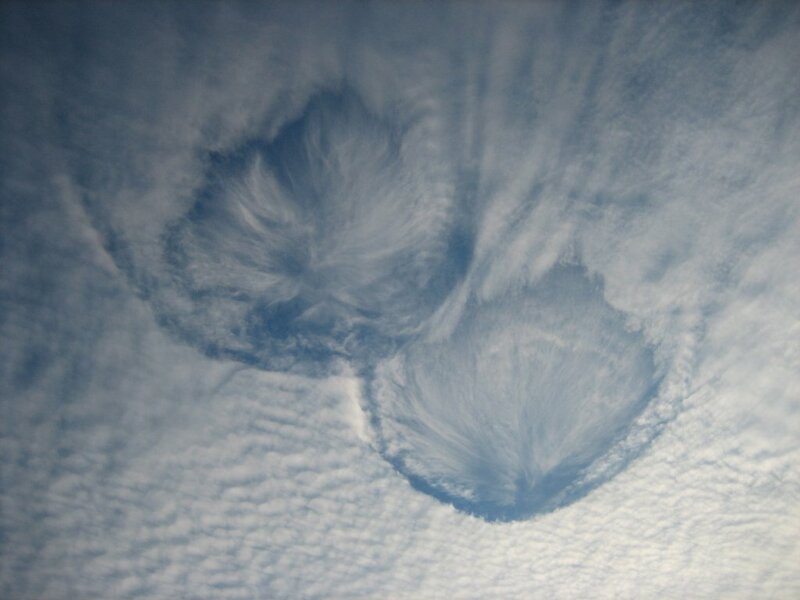 If you keep your eyes on the sky you will see clouds that look like this. You can’t miss them they are everywhere. For decades, governments and scientists worldwide have been denying the existence of discrete operations which (for various reasons) use military aircraft to spray our skies with chemical toxins. Governments are now finally admitting that geo-engineering is a reality and have stated that despite any detrimental affects to our health, it will continue these operations indefinitely. So they lied to us in the past but now are coming clean and telling us the whole truth right? They use these chemical toxins spraying operations in conjunction with Haarp. The would be constructed Haarp Project. Looks like it’s real to me and already is constructed. A high power transmitter and antenna array operating in the High Frequency (HF) range. When complete, the transmitter will be capable of producing up to 3.6 million Watts to an antenna system consisting of 180 crossed dipole antennas arranged as a rectangular, planar array. A complete and extensive set of scientific instruments for observation of both the background auroral ionosphere and of the effects produced during active research using the transmitter system. Output from these instruments will be combined into an integrated data package which will be available world-wide in near real time over the internet. During active ionospheric research, the signal generated by the transmitter system is delivered to the antenna array, transmitted in an upward direction, and is partially absorbed, at an altitude between 100 to 350 km (depending on operating frequency), in a small volume a few hundred meters thick and a few tens of kilometers in diameter over the site. The intensity of the HF signal in the ionosphere is less than 3 microwatts per cm2, tens of thousands of times less than the Sun’s natural electromagnetic radiation reaching the earth and hundreds of times less than even the normal random variations in intensity of the Sun’s natural ultraviolet (UV) energy which creates the ionosphere. 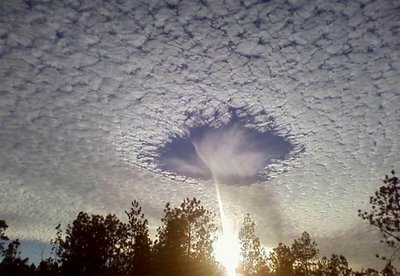 The small effects that are produced, however, can be observed with the sensitive scientific instruments installed at the HAARP facility and these observations can provide new information about the dynamics of plasmas and new insight into the processes of solar-terrestrial interactions. HAARP would be, constructed at auroral latitudes in Alaska. (See picture above) A unique feature of the research facility would be a high power high- frequency radio transmitter with the capability of rapidly steering a narrow beam of energy toward a designated region of the sky. Similar, though less capable, research facilities exist today at many locations throughout the world and are operated routinely for the purpose of scientific investigation of the ionosphere. In the US such systems are located at Arecibo, Puerto Rico and Fairbanks, Alaska. Other installations are at Tromso, Norway; Moscow, Nizhny Novgorod and Apatity, Russia; Kharkov, Ukraine and Dushanbe, Tadzhikistan. 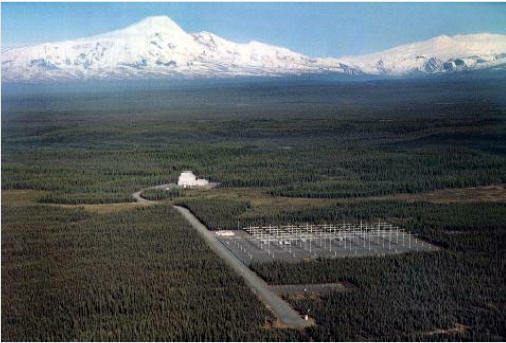 None of these existing systems, however, have the combination of frequency capability and beam steering agility required to perform the experiments planned for HAARP. So, lets just take pot shots into the ionosphere and see what happens. If you believe that they can not steer the beam, then maybe you’ll believe my dog can speak seven languages. Weather Modification may adversely impact agricultural crops and water supplies. If the weather is changed in one state, region or county it may have severe consequences in another region, state or county. And who is going to decide the type of weather modification experimentation and who it will benefit or adversely impact? Artificial weather modification can impact all of us by reducing water supplies, changing agricultural crop production cycles, reducing crop production, and water availability. Since most experimental weather modification programs use chemicals released into the atmosphere the public could be subjected increasingly toxic or unknown substances that could adversely impact agricultural crops and trees. Growing your Non GMO garden vegetables in a greenhouse could help to eliminate the effect of falling toxic elements use by the Haarp Project. Composting with worms will help eliminate the effects that these chemicals produce in the soil, to help combat these Geo-engineering effects. OK, How about this one. Does this look like Normal Cloud Formation to you? Does this really look like just jet exhaust, or just a contrail? Aren’t these really just Contrails? Yes, and Santa Claus lives at the North Pole. Look at the wing tips, this not jet exhaust . It’s Chemtrails. What Chemicals are being used and released? 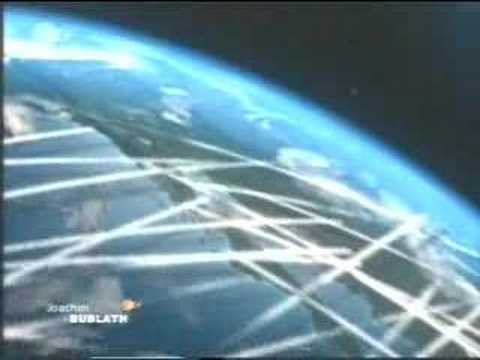 Weather control and geo-engineering projects are in full swing all over the world. Why are they changing what Mother Nature has managed for eons. Who do they think they are? What or who gave them the right to change this planets ecosystem? Aluminum, Barium, Strontium, Titanium, Boron, Arsenic just to name a few. There are hundreds of websites that can give you in-depth information on all these elements and chemicals being use and the health effects on the human body and plant life and soil. Aluminum should not be found in rain water. 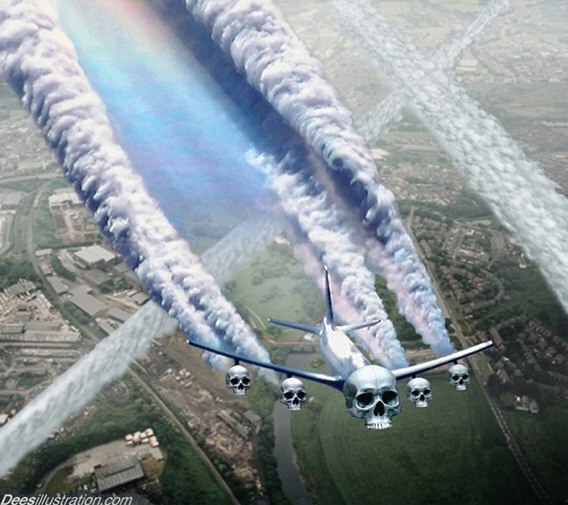 As well as barium, there is strong evidence to show that the massive aerosol operations that are going on around the world, include the spraying of Aluminum and Barium. Disturbingly, this is being found to have a devastating impact on eco-systems in some regions. In an area of Shasta County in California, where a lot of research has been conducted into the impact of these aerosols, it has been established that Aluminum is altering the pH of the soil from acidic to neutral and causing the trees to die. Barium oxide has cropped up repeatedly as a contaminant from suspected geo-engineering experimentation. This substance does not occur as a mineral, but can be prepared by heating barium carbonate. Barium causes asthma, which has reached epidemic proportions across the world. It’s also a powerful immune suppressant. In the barium mines the workers all have what’s called baritosis, a special type of asthma, which surprisingly is worse on the weekend when they’re not in the mines working. It gets better when they return to work. Did you also realize we have a flu season every year and that it can last over 8 to 9 months? “Get your flu shot”. No Thank You! The incidence of allergies have risen so much that pharmaceutical companies profits have tripled on their allergy medications and it can only be coincidence that those rise in profits also mirror the rise in aerosol operations which began in earnest in the fall of 1998. Their either just lucky, really good business people, or there’s more behind the scenes then we know. What is Barium and how is it used? Barium is a lustrous, machinable metal which exists in nature only in ores containing mixtures of elements. It is used in making a wide variety of electronic components, in metal alloys, bleaches, dyes, fireworks, ceramics and glass. In particular, it is used in well drilling operations where it is directly released into the ground. Why is Barium being regulated? In 1974, Congress passed the Safe Drinking Water Act. This law requires EPA to determine safe levels of chemicals in drinking water which do or may cause health problems. These non-enforceable levels, based solely on possible health risks and exposure, are called Maximum Contaminant Level Goals. For me the EPA stands for Experiment on People and Apply. They are just another government controlled bureaucracy doing what it’s told. I have only scratched the surface on this topic here. I urge others to investigate this topic and to get their rainwater tested in their areas. The more evidence to show there might be a criminal operation taking place without our consent, the easier it will be to draw the public’s attention to it. Possibly getting this poisoning of us stopped! Don’t take my word for it. See it for yourself. If you can’t believe your own eyes then who can you believe? I’m sure you can take it from here. Thank you for being here, Please share as much or as little as you wish.